Not all drop ceiling tiles are created equal. In fact there are major differences in many of the ceiling tiles produced today. For some people who install a drop ceiling in their basement, sound quality isn’t really that important. They just want to cover those nasty wood joists over their head. In my experience when customers are choosing a ceiling tile, looks seem to take the #1 position and this is usually followed by price. But for some people who invest quite a lot of money into their basement to make it as nice as the main level, having a ceiling tile that actually performs as nice as it looks is something that shouldn’t be overlooked. We can hear everything that goes on in the basement. How do we stop that? We are installing a surround sound system and we want to improve the sound quality of the room. How do we do that? Our basement is humid and we want to keep the tiles from sagging. It’s very dark down here in the basement, how can we brighten it up? The ceiling tile has to be washable and fire rated because it will be installed into a commercial kitchen. Do you have that? Believe it or not there are plenty of ways to address these concerns and educating yourself on the acoustical qualities of drop ceiling tiles will allow you to make an educated decision. 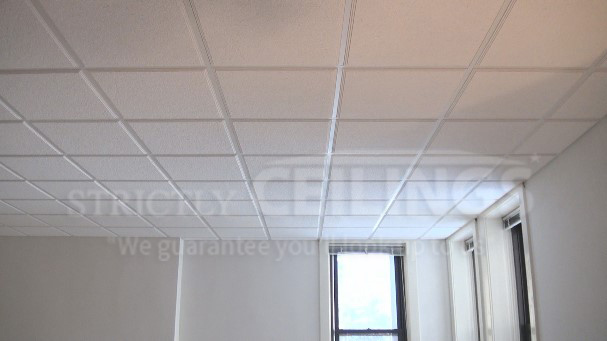 Let’s take a look at some of the acoustical qualities for ceiling tiles. 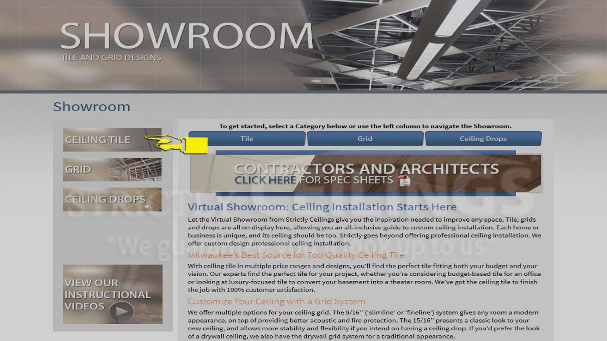 There are two ways to find out how a ceiling tile will perform in a particular application. You need to look at what is called the data performance sheet or chart. You can look for the data performance information either in the manufactures catalog or on the back of a sample panel that you receive from your supplier or installer. A great resource at your fingertips is our website. On our website click on the Showroom Tab, then select the Tile tab. You will then choose from the three price points of Basic, Mid-range or High end. We have listed a variety of tiles to choose, so choose a tile that best fits your project. In each section you will see pictures of what the finished tile looks like as well as a close up of the texture. Here’s how it works. 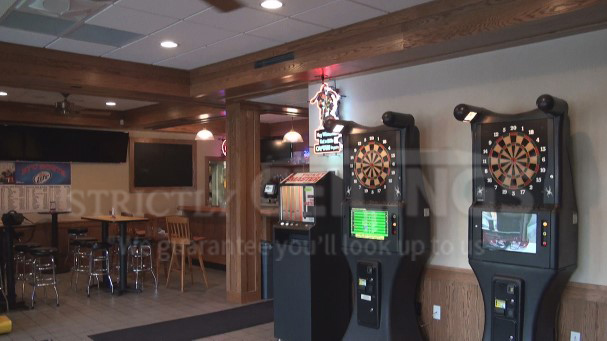 Let’s say your project is in a basement and you’re installing an entertainment center. You want to improve the acoustics and keep the room from echoing. Take a look on the back of the sample tile or the data sheet and you’ll find a rating that says NRC. NRC stands for “Noise Refractive Coefficient”. This is one of the most important ratings found in ceiling tiles. This rating measures the amount of sound that a ceiling panel can absorb. 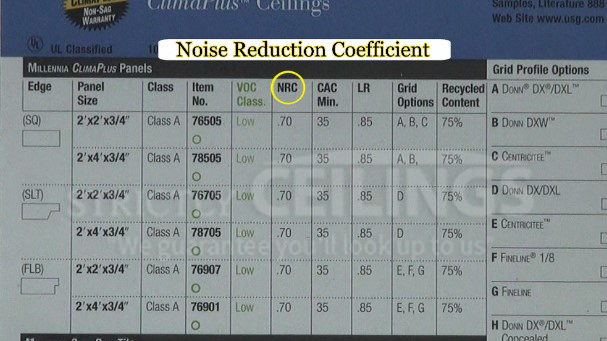 Ceilings with a high NRC value are designed to reduce the reverberation within a space. Do not confuse this with sound transferring though the panel to the upstairs, NRC only prevents reverberation and echoing in the space. NRC is represented by a number between 0 and 1.00. This number indicates the percentage of sound reaching the panel that will be absorbed. In short…a .70 rating indicates that 70% of the sound striking the panel will be absorbed and 30% will be deflected back into the space. A .50 rating is considered to be average. Now let’s look at another application. 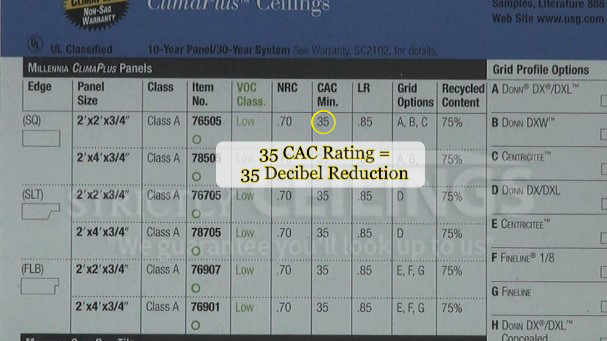 If your project is a commercial office where you don’t want others to hear your conversation in the next room, or your application is residential and you don’t want the sound to be heard in the next floor above, then you want to look at ceiling tiles with a high CAC rating. CAC is referred to as the “Ceiling Attenuation Class”. 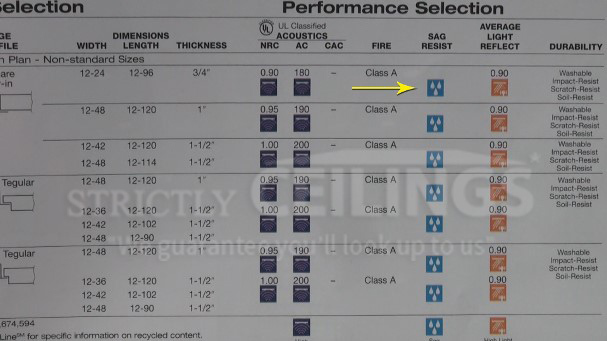 This is very important, especially in office spaces and basements because this rating indicates the ability of a panel to reduce sound transmission. In other words it prevents sound from traveling through the panel up over a wall and down into the next office or up into the floor above. Panels with a high CAC will improve the privacy in enclosed spaces. 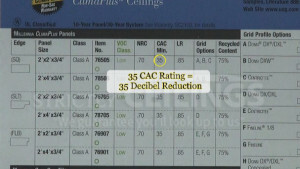 A ceiling panel with a CAC of 35 will reduce transmitted sound by 35 decibels. Panels with a rating of 35 or higher are considered to be good panels. 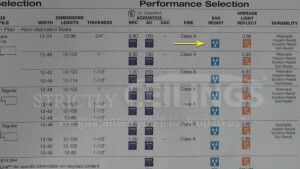 Most panels have the option to increase the CAC rating. Check with your contractor or supplier for available options. Let’s look at another important factor. Every basement and most offices need more light. You can improve the light reflectivity of the room by choosing a panel that is design specifically for that application. This is indicated by an LR on the physical data sheet. The ability to reflect light is important as it achieves three main things. Higher ratings can reduce energy consumption costs by as much as 18%. You can achieve substantially brighter spaces with up to 25% more usable light. A higher rating will give you more balanced light coverage because of the consistent surface finish that is similar to a painted ceiling. There’s another important factor that will help you determine which panel to choose, and that’s a ceiling panel’s ability to resist humidity. 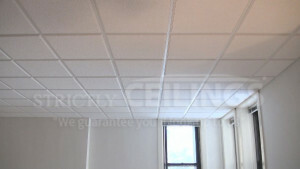 Most ceiling tiles will last for years as long as they are in a controlled environment. Standard panels have little to no resistance to humidity and over time you will begin to see the panel sag. If you are installing ceiling tiles in a basement, it’s always a good idea to choose a panel with an increased resistance to humidity. In this case you’ll want a panel that either has the added Clima Plus by USG or the Humiguard Plus by Armstrong or Bio Shield by CertainTeed. These tiles are commonly tagged with a water droplet icon on the data performance sheet. Panels with this feature are sag resistant up to about 94% relative humidity and also offer extended warranties from the manufacturers. Not all drop ceiling panels are resistant to humidity, that’s why it’s good to know what you’re purchasing up front. If you need to install panels into a commercial kitchen or a bathroom, most building codes require the use of a vinyl coated sheetrock tile or other type of non-porous washable surface. These panels are basically drywall with a piece of laminated vinyl on the face and others are standard fiber based materials with a non-porous vinyl laminated onto the surface. These panels are typically 100% resistant to humidity and fire rated as well. Understand though that while these panels are fire and water resistant, most of them offer no performance when it comes to sound absorption. Hopefully you will have more confidence when choosing which type of ceiling tile to purchase. 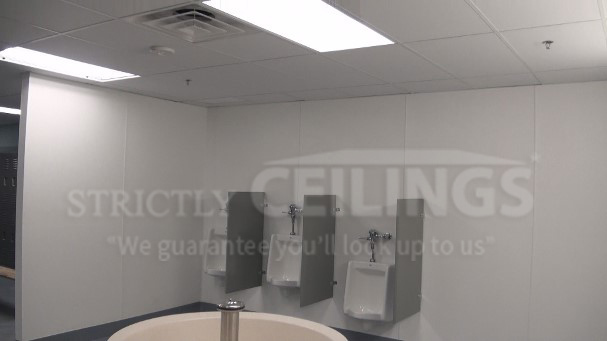 Take a look at the video for further information and details on drop ceiling panel performance ratings and specifications.